Custom bedspreads are a far cry from ready-made offerings: fitted, fitted with a gathered skirt, semi-fitted and classic throw styles are available in thousands of fabrics and trims. Bedspreads can be quilted or not to suit your taste. Add coordinating pillow shams and your custom bedding is complete. Made to the exact measurement of your bed, bedspreads can be tailored or fancy, casual or formal, quilted or unquilted. Lighter than comforters or duvets, coverlets create a beautifully layered bed. Falling just below the mattress, coverlets are lined and can be made with your choice of fill weights. They can be tailored or fancy, casual or formal, quilted or unquilted. 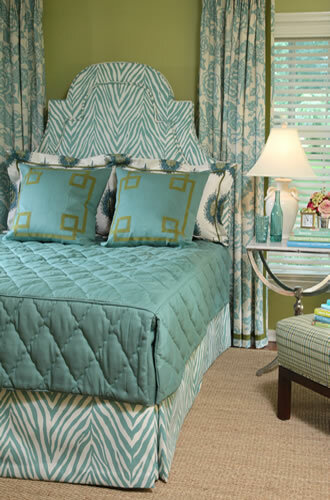 Matelassé fabrics make beautiful coverlets. Suitable fabrics include light to medium weight fabrics for quilted style. Heavier weight fabrics may be suitable for unquilted styles.